I, the Duke’s daughter Carol Ambrose, one day suddenly had my engagement broken by my fiancé his Highness Reyford. I completely don’t have any recollection of harassing or trying to push anyone off the stairs though. But since it’s a good opportunity, I think I’ll propose to the Knight Captain I’ve yearned for ever since I was young. 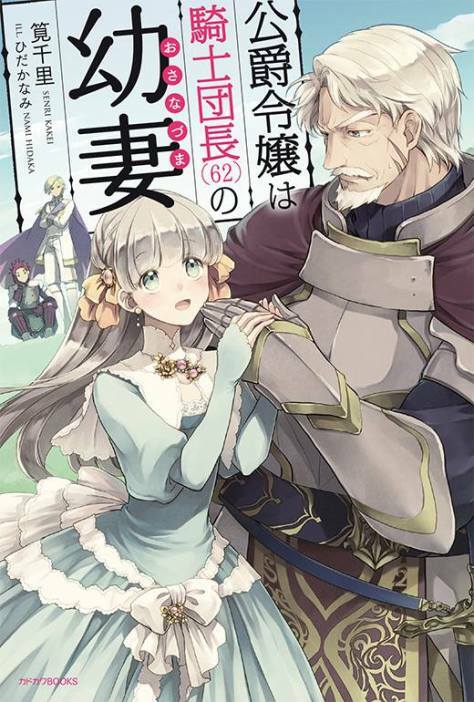 Because towards the white bearded and 62 years old knight captain Wilhelm-sama, there isn’t a single frivolous rumor and he’s still a bachelor. Starts as a nice, fluffy sort of love story. Lost interest after the heroine hinges her whole existence on another person liking her. The repeated statements "I'll kill myself if you say you don't return my affection" are a pretty terrible character trait. I'm sure it'll eventually turn around, but... hard pass. Well, the threat of suicide is what made me completely not gonna read any further, it is the only reason. Otherwise I am sure I would have enjoyed it, which was supposed to be a fluffy kind of romance. It is just that NG and to be frank, I have nothing positive to say to anyone who does not see it as major con at least and I do not think I have to elaborate on why such a thing is quite possibly the worst that can happen in a "fluffy"... more>> romance. I really am tempted to make an exception to my "no rating unless absolutely perfect" way of doing ratings (rather sticking to systems like Steam's which are binary recommend/not recommend) but I shall resist it, merely only noting how awful this is in comparison to other BS that is pulled in other works. To close to real? Quite possibly but also an affront to the very sub-genre. 2) Somehow manages to be innocently cute and fluffy! 3) Wilhelm Aibringer-sama is such an upstanding gentleman that the world 'pervert' is smote down within his presence automatically! Although it does sound cute and refreshing, I mean after so many stories with the same progress, I have a little... Maybe a big problem with this one. The main character speak times after time that the one she actually loves is wilhelm and at first I thought it was like that and she was just a super cute maiden in love, BUT whenever she's with Wilhelm things get reeeeaaally sketchy. Up until where I read, chapter 17, he doesn't have feelings for her and when he tries to convey... more>> that or when she realizes she is being intrusive, she goes "oh I would kill myself" "I would give up on happiness and things like that, and wilhelm clearly gets uncomfortable and accepts the situation with a lowered head. Do you see the problem? The main cute fluffy character feels more like cunning manipulative b**** who knows the guy will do anything for her to be unharmed, and uses that to make him and WILL use it against him to get that she wants (him). It reminds me a lot of Marietta-hime. The premise does, at least. The play on the otome game-like beginning made me chuckle, although I'm not entirely certain that was the desired effect. It's a good romance even though the author plays a little bit too safe by adhering to commonly established working plot so people who reads a lot probably can guess the structure of the story easily. The story itself is rather light so it's decent for quick read and entertaining but on the other hand almost every conflict is resolved rather fast. Maybe it's like salad, easy to digest and fresh but for people who's hungry it's a little bit unsatisfying. later that's cleared up as something she learned from romance novels. Her mother also set her straight that the way she was acting was wrong. So yes the author purposely put that end there for a reason. I say give this novel a chance. Its not to my taste, but it is a good albeit fluffy story. Carol is a pretty sensible, but innocent protagonist, she swallowed down her desires and gets engaged to the prince; only for that idiotic prince to break his engagement and denounce her in front of many. Free from her shackles of queenhood, she takes her freedom grabs onto Wilhelm as soon as possible! And thus we start Carol’s journey to woo Wilhelm. Overall, it’s pretty light hearted and Wilhelm is a gentleman through and through, who tries his best... more>> to dissuade Carol. Carol’s also likeable, she’s not one of those hyper, “my pace!” Protagonists, she’s smart but not a schemer, and generally pretty down to earth, albeit a bit naive and tries to employ romance novel tactics sometimes. My only “complaint” would be the one chapter explaining how Wilhelm was best friends with her grandfather, and came to see his best friend’s family like his own (he originally saw Carol as his granddaughter and was mad at the prince rejected her in such a way). With that kind of chapter, it made me feel kinda “eh” about a girl whose like a granddaughter coming after you. Carol really does end up with Wilhelm in the end! Being a young woman interested in forbidden romances, I was excited about the vast age difference in this story. I wanted to know how the characters, despite being so different, would interact with each other. In the end, it feels like a story written by a 13-year-old (mind you, I only read to chapter 24). It's as if she will not accept Wilhelm (62) not accepting her. It does not matter that he does not like her, she will stay annoyingly at his side, but if he says he does not like... more>> her she will cry and threaten to bite off her tongue. At this point, it's not like he has a choice but to accept her. Uggggh... She is an idiot, dense, naive, and annoying. I would not have minded her being like this so much if Wilhelm (62) was not just as big an idiot. He ALWAYS gives into her, never correcting her behavior, and from the beginning already seems to have fallen for her pushiness. Despite being a hardened-war-hero he believes weapons should not be used when patrolling. He says it is because weapons should not be used against citizens... But do they not patrol to protect citizens? If you were a soldier, patrolling the town and you came upon two young children being kidnapped to be sold into slavery, pulled along by 5 large men with nothing to lose you would want a sword to protect yourself with. I say 'protect yourself' because that's probably all you could do at that point, let alone save the kids. Carol is adorable. She is hard-working and tries hard to be understanding. Wilhelm is loyal and pure. The character ideas themselves are not terrible. It has a good amount of politics, even. Yet, the innocence overshoots the basket by a mile. It is overwhelmingly simple and hardly realistic. I was quite disappointed. Too bad the story drop because of the huge age gap. I think this is a sweet story, I don't mind the huge age gap because willian is so gentlemen. She should be together with him. The crown prince (ex-fiancee) is so stupid and annoying. Tsk. It is better for them to be run over by the other kingdom if he is an idiot. Plus the girl who became the new fiancee is dumb too. Lol. MC was a spoiled brat at the previous chapter. E. I did not gave a rating, for now. After finishing re:zero Wilhelm-san you have a new job now huh... Wait I thought you're married!? Well anyway onward with the review. It's a very refreshing story after reading nothing but cliche love stories.